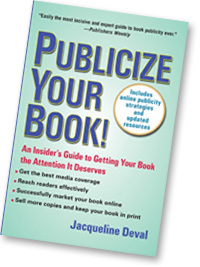 Bookmark this page for its selection of helpful resources from PUBLICIZE YOUR BOOK! Go to www.booktv.org, the online complement to Cspan2 Television’s Book TV programming. The site includes a full listing of book fairs as well as other useful information about author venues. Find store locations at bookstore chains by visiting the home pages of bn.com, borders.com, and booksamillion.com. To find independent bookstores, go to booksense.com or bookweb.org. The trade magazine of the talk radio industry. Click onto the “Heavy 100” section of the archives to find an annotated list of the top 100 talk radio hosts, and a brief description of their shows and contact information. The site also sells a radio media directory. Offers several radio media packages. If you can’t find radio media lists for free, then his more expensive radio media databases are up-to-date and downloadable on mailing labels and as call sheets. Search for stations by zip code, city, state or province, format and call letters. Links to all the National Public Radio stations nationwide, and many of the sites will give you information about the shows’ producers.